RBTH presents a selection of views from leading Russian media, featuring an interview with OSCE special envoy to Ukraine Wolfgang Ischinger, an assessment of the value of roundtable talks in Ukraine, news of the extraordinary session of the Russia-NATO council, and the continuing failure of Russia and Ukraine to reach agreement over gas repayments. The newspaper Kommersant published an interview with Wolfgang Ischinger, the German OSCE special envoy to Ukraine, whose mission ended in scandal when the Russian Foreign Ministry accused him of calling for an intensification of the “anti-terrorist operation” in the Donbass. The German official called these allegations groundless, claiming that the precise opposite was the case. 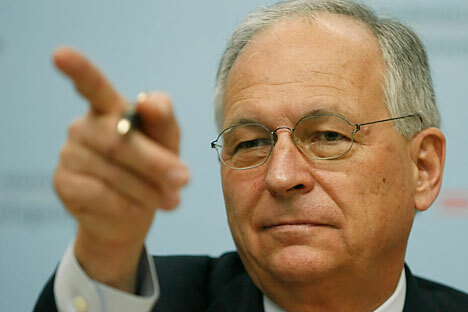 “In the framework of the OSCE’s mandate, Ischinger resolutely and persistently spoke in favor of as full a truce as possible, so as to give Ukraine’s eastern population the ability to completely participate in the elections, unhindered,” writes Kommersant. Kommersant also said that the latest roundtables “have been useless because the militia leaders did not participate in them.” In response, Ischinger said that the roundtables “cannot take the place of peace negotiations – the separatists would not participate in them, even if they received invitations in golden envelopes.” However, in the special envoy’s opinion, without their participation, the roundtables have made an important contribution to stepping up the national dialogue outside of parliament. “I am convinced that these roundtables will continue to be useful for the political development of Ukraine,” Ischinger added. According to Kommersant, the OSCE is prepared to continue facilitating the negotiation process in the future. “It would be good if the Russian side also completely supported this initiative, as the EU and the U.S. are doing,” Ischinger said. Moscow wants NATO to demand that Kiev terminate its “punitive” operation in the Donbass, to adhere to the terms of the Geneva Memorandum, and to adopt a roadmap prepared by the OSCE. However, according to Expert, NATO said that Kiev should not be pressured. NATO’s Secretary General Anders Fogh Rasmussen rejected Russia’s request, noting that NATO and Russia have “fundamentally different” positions on the issue. It would be rather naïve to expect NATO to facilitate Russian plans to stabilize and federalize Ukraine, Expert reports. Gazeta.ru reports to its readers that the latest round of three-party negotiations regarding the Russian-Ukrainian gas conflict “have again failed to definitively solve the problem.” Another meeting may be required to solve the conflict, and an urgent one at that, given that June 9 is the deadline for Kiev to pay off its debts. Otherwise, Gazeta.ru reports, Ukraine is waiting for a transfer to repay. However, the parties did manage to cover some ground and strike an agreement that this issue would not be resolved at the Stockholm arbitration court. According to an expert at Gazeta.ru, Kiev is trying to bring gas prices down as far as possible.